Classrooms urgently needed at La Bonne Nouvelle School, Burkina Faso. A trip to Burkina always brings surprises, learning new aspects of Burkina life, the good the bad and the ugly. On the “bad” we happened to notice more and more young boys, carrying tins looped with string around their necks, roaming the streets. We learned through discussions with Esaie our guide, that these teenagers are kicked out from their family homes and told to live on the streets. With their tins, they roam and beg until they are 18, after which, they are accepted back to the family. Our guide commented that these lads came from large, poor Muslim families and it is seen as a rite of passage for them to undertake street life. On the “good” it was great to see the enormous impact the medical centre is making in the community and how many children are so keen to be in school with large ambitions. The “ugly” was the growth of “slum-like” conditions in the Colma district of Bobo where more and more families live in such close proximity; with their livestock, no sanitation and no refuse collection. The streets are being piled up with rubbish, which will cause more medical emergencies going forward. Bobo is a city that had a population of 600,000 ten years ago. It now exceeds 1.5 million. Increasing numbers of families migrating to the community mean that many more children are searching for school places. Many families cannot afford a school place, which is why we see an increase in the numbers of street boys begging. 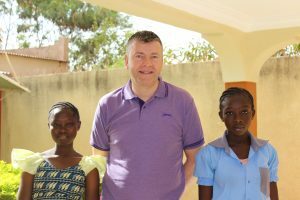 Whilst in Burkina Faso, our group met with a number of families, one of which was a mother with her 4 children (3 sons and a daughter). The mother had recently been widowed and was struggling to make an income. To make money she spends her time making food and selling it on the street to passers-by. She makes enough money to feed them all and send her sons to school. Fatoumata and one of her brothers. Her daughter Fatoumata did not have a school place and educating her wasn’t considered a priority in her Mother’s eyes; she considered the education of her sons as more important. Many of you reading this blog sponsor a child like Fatoumata and help them gain an education. At International Needs, our vision is to help all children like Fatoumata to have the opportunity of education and all of its benefits. After discussions with the Board of IN Burkina Faso, we learned about the pressing need for local school places. This is an urgent problem for the community and increasing capacity at La Bonne Nouvelle (The Good News School) has become a top priority. 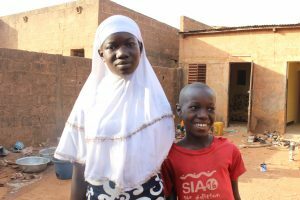 We want to help more of these young Muslim boys off the streets and marginalised girls like Fatoumata to find a place in school. Compounding the problem of overcrowding in schools is the effect of the unlicensed schools operating in the area. These schools take advantage of poorer parents and children by taking money but having no interest in providing quality education; class sizes in these schools can reach up to 200 pupils! Last year the government shut down 71 of these unlicensed schools displacing thousands of students. This has put pressure on the entire education system as thousands of more children are now looking for new school spaces. 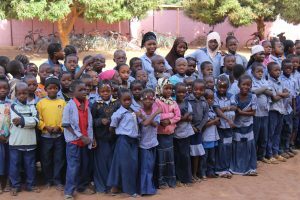 The Burkina Faso Ministry of Education has asked La Bonne Nouvelle School to take on an additional 140 paid places and has committed to continue funding them for four more years. There is pressure on the school to help yet we don’t want to sacrifice offering these children a quality education. This September the school may attract nearly 700 pupils, increasing its capacity by 30%. To avoid overcrowded classes we urgently need to build another four classrooms. The project will cost £15,000 per classroom and we will include foundations to allow for new classrooms to be built on top for future expansion. We have already been pledged enough money to begin building in April, but we need to raise a further £45,000 to ensure the classrooms are complete before the school term begins in September. Together we will be able to include more children in quality education.